The easiest way to spice up an ordinary outfit is to add a dose of fun sequins to your ensemble. Of course, when it comes to wearing sequins, you must pay careful attention to styling, because the line between glamorous and garish is quite fine. The first and most important rule to remember is that sequins should always be paired with a piece that is not loud. As a rule of thumb, always pair your sequined garment with plain pieces in neutral hues like white, grey, black, navy blue or beige. In fact, this is an important trick to keep in mind when you are wearing anything that is sparkly and embellished. By matching your sequins with a plain piece, you can ensure that the sequins are the center of attention without going OTT. Having said that, feel free to experiment with the colour of sequins that you wear. These embellishments come in almost every colour you can think of. Remember, stick to only one shade of sequins. Mixing them up in different colours is not a good look for anyone. When purchasing a sequined garment, pay attention to the cut and fit of the piece. Since the embellishments are rather bold in their own right, balance out the loudness with demure silhouettes that up the level of sophistication – think higher necklines and longer hemlines. Also, remember to keep the silhouettes as simple as possible. Complex shapes and structures combined with sequins is a path that you do not want to take. If you are hesitant to go all out with the sequin trend, you can still sport some sparkle in smaller quantities. Look for accessories that are sequined for a tinge of subtle pizzazz. Hair accessories are great for some slight bling. Investing in a pair of sequin high heels or ballet flats is always a great idea too because it is the easiest way to take your outfit to the next level. Finally, remember to differentiate between sequins that are appropriate for the day and night. The two cannot and should not be interchanged. 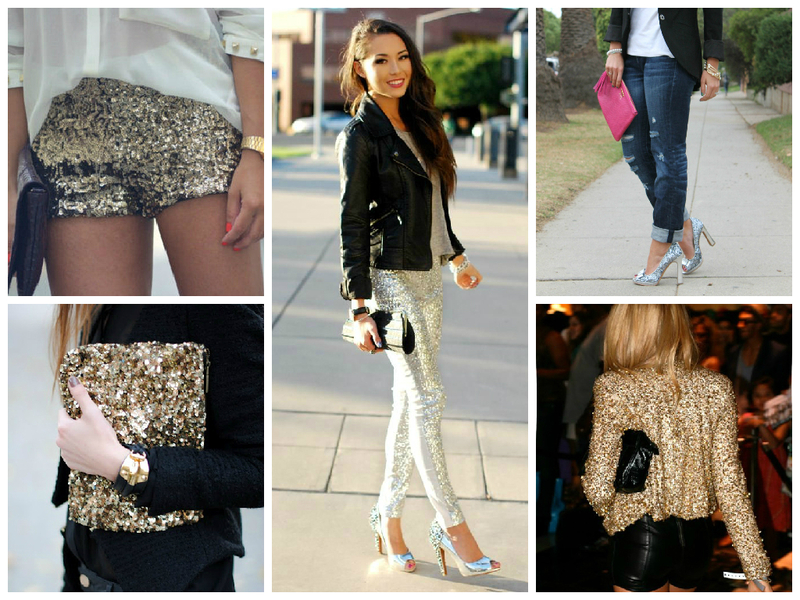 To wear sequins during the day, opt for pieces with sequins details in the form of a pattern or panel. For the evening, feel free to opt for garments that are embellished with sequins all over them. The trick to keep your outfit together is to keep your accessories as minimal as possible. When wearing something as shiny as sequins, it is always a good idea to wear jewellery that is subtle and delicate. No statement necklaces here, please! Your handbag and shoes should also be subtle enough to blend in. Keep the rest of your outfit as minimal as possible allows your sequins to stay in the spotlight without blinding anyone. The same rule applies to your hair and makeup, too. Finally, remember that the best trick for pulling off any bold look is to carry yourself with confidence. Stick a large smile on your face, walk with your head held high and shine bright like a diamond!